This was OK. I found the taste a bit harsh, so I softened it with a bit of crème fraîche, and then it was very good. Mayonnaise might work as well. Pg. 53. For the past several years I have been disappointed in the quality of the fennel bulbs we've bought. Fennel is in season now in New England yet, no matter where I buy the bulbs they're tough and virtually tasteless. I used to love it's cold crisp sweet flavor. For this recipe I swapped out the orange slices for Pinata apple and loved the combination. It could be a nice little salad if not for the bland fennel. Very nice, which is unsurprising given the ingredients. The citrus mixture to poach in is very nice, but this recipe does remind me that I do not like chicken breasts. They are just so bland. Next time I'll use chicken thighs. The children did like it a lot. Also, the poaching time given is much too short. I didn't hear the kitchen timer go off, so when I checked I was afraid they might be overcooked. They were still quite pink on the inside. This sauce was much too sweet for my liking. Beans with an Asian twist. Nice, but not really special. Needs a squeeze of lemon. Not my kind of thing - a quite harsh flavor that is not really softened by the butter. Slightly better with a squeeze of lemon, but no repeat. This invaluable resource offers painless ways to create impressive and delectable meals in minutes. 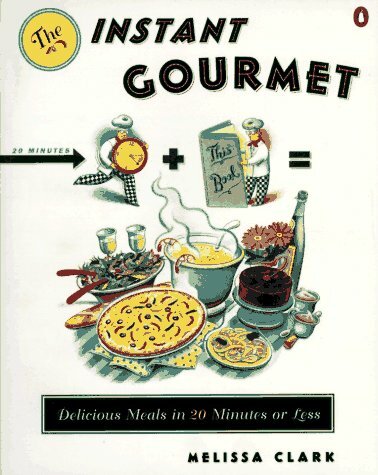 Featuring more than 200 recipes for appetizers, salads, entrees, desserts, and more, The Instant Gourmet shows cooks how to prepare exciting meals that will appeal to the eye, the budget, the schedule and, best of all, the palate. Line art.